This festival is sure to please every hungry traveler! Fun for the whole family is right here at Spirit of Suwannee Music Park. This annual festival brings in professional cook teams from all over the Southeast including Georgia, Florida, Alabama, South Carolina, and Tennessee. Tickets can be purchased at the ticket booth for $1 and then you can purchase bbq sandwiches, dinners, at several booths along the festival way. The money raised for this event goes to Benefit the Suwannee High School Future Farmers of America Program. Winners of the BBQ cookoff get cash prizes, and gain points toward the next level of competition in Kansas. These are serious bbq competitions. The best bbq samples you will find anywhere! The whole festival is located in the fabulous Spirit of Suwannee Music camp,located in Live Oak, Florida. 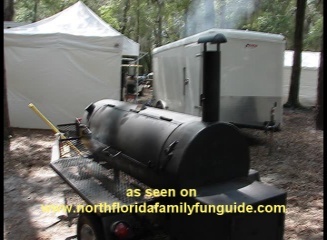 From their website, " The Spirit of the Suwannee Music Park is a resort and campground in the heart of the world famous Suwannee River recreational area. The Spanish moss-draped forest of more than 700 acres, a cypress tree lined, spring-fed lake, fresh water fishing and canoeing, wildlife habitat and bird watching are sure to please." They have so many family friendly activities, this is a great place to camp! They have an SOS Cafe & Restaurant, open 7 days. They have a swimming pool and ice cream shop. They have a country store, miniature golf, frisbee golf, geocaching and a Craft Village. In the craft village they have crafters demonstrating how to make such things as wax candles, weaving, woodworking, and more! You can hike the well marked trails, go canoeing on the Suwannee River, go fishing on the river, or their lake, horseback riding and more! They have a horse camp, so you can bring your horses and camp comfortably, then ride the many trails adjacent to the park through the water management area right along the Suwannee River. The calendar of events at the Spirit of Suwannee Music Park is packed with fun things to do all year round! They have a Kids Music Camp that is FREE for kids while parents camp for the weekend. Kids will be taught to play an instrument during several classes, and then there will be a concert Saturday night where all the kids perform their newly learned music skills. How fun! You can rent a golf cart to get around the expansive park activities for very reasonable rates.